It was the summer of 1964, and as the house lights came up, the first notes from the overture of South Pacific drifted into the treetops. The first production at Jenny Wiley Amphitheatre was brought to life. Now in its 54th year, the Jenny Wiley Amphitheatre is one of the longest-running outdoor theaters in the United States, and, in turn, has established itself as one of the premier regional venues for professional live theater. Located in Jenny Wiley State Resort Park, the open-air stage seats around 750 people and blends into its surroundings, creating “a communal experience for actor and audience alike,” said Casting Director Joey Murray. This summer will be Murray’s 11th production with the Jenny Wiley Theatre. These days, Murray works alongside Managing Theater Director Darryl Willard. Willard is now in his seventh year at Jenny Wiley Theatre, serving the last three as managing director following a four-year stint as technical director. Their collaboration conveys the excitement and dedication to live theater and, ultimately, to their audiences. “I don’t think there’s anything as nice as when it’s beautiful out, and you’ve got a great show going, and the audience is full,” Willard said. “Both Darryl and myself are deeply committed to custom theater unlike anything anyone has ever seen before. How can we tell the story in a way that the audience is going to want to see it, and also surprise and challenge them?” Murray said. This year’s productions are a small town challenged by rock-n-roll in Footloose and the quirky retro-inspired comedy, Hairspray. Murray and Willard share a deep commitment to their craft, from the casting to set design, and provide a place of growth to rising theater talent, which Murray describes as a “matchmaking” process. Their combined experience creates a chemistry between cast and crew members that contributes to the performance magic onstage. Jenny Wiley Theatre sets a gold standard for stage productions and continues to uphold that tradition with its live five-piece orchestra and professional staff. The first step in the process begins with the input by JWT board members. The committee chooses two recognizable, family-friendly shows to produce. With that decision made, Willard and Murray then begin to look at options for cast and crew. Though plans are set months in advance, they conduct auditions in the spring. Roughly 70 percent of the company is cast through a “cattle call” audition, and the remaining 30 percent from the “cream of the crop” of the local talent pool. “You often wouldn’t know who’s who — whether they are local talent or casted from New York City — our kids are part of a professional production. And that’s the point, that’s what we’re trying to do,” Willard said. Regional theater is an important stepping stone for rising designers, actors and other personnel. Murray, who is directing Footloose this summer, exudes appreciation for his experiences at JWT. During the rest of the year, Willard emphasizes JWT’s mission to serve the region as an educational facility through its Footlights Youth Theatre summer camps, workshops and productions in Pikeville. Willard nurtures local talent from the ground up with the help of his wife, Kim, who serves as the educational director. The Footlights youth workshops take place at Jenny Wiley Theatre’s main campus in Pikeville. 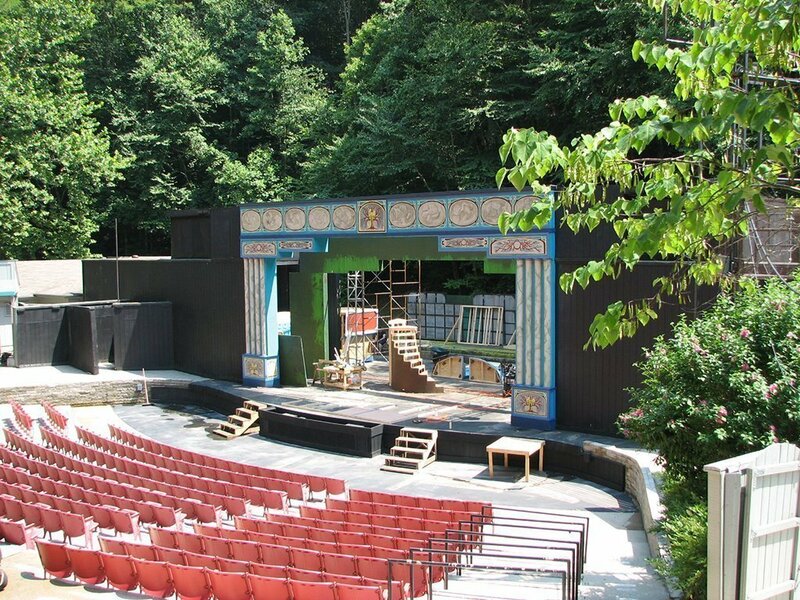 The amphitheater in Prestonsburg was the primary production location for 50 years until 2014, when the cities of Prestonsburg and Pikeville established a mainstage indoor theater and educational facility. The two locations help expand the theater’s outreach. Footlights summer camps provide children in eastern Kentucky the in-depth opportunity to learn the craft of theater from the pros. Participants learn every phase of producing a live stage production, from acting to behind-the-scenes roles, with hands-on experience and ample performance opportunities year-round. “We have a great student this year, Payton Trout. He started [in Footlights] and is going to play Corny Collins,” Willard said. The character Corny Collins is the host of a TV dance show in Hairspray. It’s an exciting opportunity for a local actor to be featured in a major role, Willard said, and is a testament to long-term development of homegrown talent. Once every role is cast, and each design element is in place, cast and crew arrive in Prestonsburg and settle into the cabins provided at Jenny Wiley State Resort Park. They begin the rigorous schedule of back-to-back eight-hour work days, with rehearsals scheduled 10 days before opening night. Though it sounds intense, the entire company is used to the demands of a face-paced production schedule. Murray initially didn’t realize what a legacy the theater company had, but soon came to appreciate how important it was to both his career and its importance to the region. “You get to be a part of a town’s history,” he said. Live theater is its own animal, which Willard describes as an “old school” experience because there are an infinite number of variables the performers and technical staff must constantly manage on any given night. That’s why Willard and Murray make sure the people they hire are prepared and, ultimately, have a good sense of humor. In January, the amphitheater was temporarily closed to repair substantial electrical and structural damage from its year-round exposure to the elements. Now that repairs are complete, production is underway for the summer season. As performers and crew look forward to the shared energy and excitement of these live productions, returning members anticipate the warmth and welcome they receive when in Prestonsburg. “One of the reasons I continue to go back to that theater is that I really enjoy the fact that they use local actors,” she said. It gives Nusbaum and other company members the chance to connect and mentor fledgling artists. The opportunity to learn by doing was something she didn’t have in high school. For Nusbaum, teaching others is a fulfilling way to help define her craft and contribute to the evolution of young theatre students. “I learned just as many things as they did,” Nusbaum said. The programs at Jenny Wiley Amphitheatre create a special bond between the community and the company members, where shared support acts as fuel for growth and progress in the region. This year, the community will celebrate its support of theater arts with an evening gala July 7 that coincides with the finale of Footloose. Footloose runs from June 15 to through July 7. Hairspray is in production from July 20 to August 11. Shows begin at 8:15 p.m. unless there is a brief weather delay. Purchase tickets on the Jenny Wiley Theatre website or call (877) 225-5598. Tickets are $13 for youth, $18 for adults. For get the latest news about upcoming shows and educational camps and workshops, visit the theater’s website or follow JWT on Facebook.